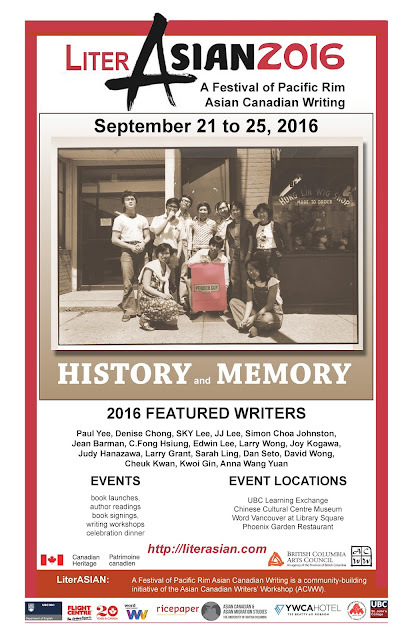 LiterASIAN: a Festival of Pacific-Rim Asian Canadian Writing is a community-building initiative of the Asian Canadian Writers’ Workshop (ACWW). Joy Kogawa’s new memoir, “Gently to Nagasaki” is presented in partnership with the Historic Joy Kogawa House, the Vancouver Public Library, and Caitlin Press. This intimate exploration, both communal and intensely personal, invites you on a spiritual pilgrimage of forgiveness and resilience. Set in Vancouver and Toronto, the outposts of Slocan and Coaldale, the streets of Nagasaki and the high mountains of Shikoku, Japan, it is also an account of a remarkable life. Following the India-China war of 1962, the Chinese Indians (the Hakka), fearing suspicion and hostility, begin to emigrate. In Picture Bride, set during a period of changing times and changing values, twenty-year-old Jillian Wu leaves Calcutta to marry a man she has never met—Peter Chou, also a Hakka—with much anticipation, only to discover that he is gay. Forced by her husband to keep up the charade of a “normal” marriage, and pressured by her in-laws to have a child, she flees back to Calcutta, only to be disowned by her conservative family. A moving story with political overtones, Picture Bride confronts the politics of family, culture, and women's rights. Come join us at the annual Word Vancouver, down at Library Square and meet our featured writers, Paul Yee, Simon Choa Johnston, JJ Lee and Joy Kogawa. Word Vancouver is Western Canada's largest celebration of literacy and reading event. Book and magazine fair celebrating literacy and the printed word. Come join in to share a meal that includes a 10-course Peking Duck dinner and have a chance to meet and talk to and get your books signed by the featured writers, in our 2016 program. Our Gala dinner is a fun-filled event which includes celebrity MCs and music from our literASIAN house band with lots of prizes and of course, a ten course Chinese meal.